Weather continues weird and unpredictable. Friday became surprisingly sunny by mid-day, though occasional grey, cold fronts blew through. Saturday, predicted sunny, was overcast all day, and turned to rain for several hours around supper. Today looks to be grey most of the day, though chance of actual rain is supposedly small. And that's the other problem. The forecast changes from hour to hour, and from forecaster to forecaster. Everyone has a favorite source, sites or app, and none of them agree. Worse, the weather changes drastically in the five miles between our motel and the fair. Microclimates. We have a lovely bunch of neighbors this year, unlike last time, when we had to listen to a pair of vendors complaining through the back of the booth all weekend. Only problem is that all of them--with the exception of the porcelain jewelry lady to our right--are art objects. Paintings, mural landscape photography, silk scarves, high-end fused glass. Harder to sell than painted pottery, especially when the potter has a head start--120 postcards and e-cards sent to previous customers before the fair started. I've said before how much I rely on repeat custom, and that was really evident on Friday, when I had a very good day while everyone else was dragging. Saturday picked up for them, thankfully, and while I had fewer customers, individual sales were slightly larger, so I ended up within $30 of Friday's total. It's tricky having a good sale while your neighbors aren't. You want to feel good, celebrate it, but you don't want to be that guy, the one who brags about his success when everyone else is failing. So you go all Midwestern. Oh, we're doing okay. Not bad, y'know. Can't complain. ...is a lot like getting dressed inside a sleeping bag. You keep shifting stuff around until you find the next thing to put on. Up at Edmonds, setting up in a drizzle. The show takes place on a baseball field, with one way in and one way out, so setup is incredibly organized. Regimented, even. To begin with, it's divided into two-hour blocks. First in are the over-sized folks, people with trailers and so forth. Next come the south-facing booths, then north-facing booths, then all the corner booths along the main concourse. Last shift is a pick-up period for anyone who missed their time, and God help anyone who shows up with a trailer. You've got forty-five minutes, tops, to get everything unloaded and your vehicle offsite. We managed it in under thirty. Even within this structure, there's fine-tuning. We figured there wouldn't be that many over-size, so arrived fifteen minutes before our time, got in line behind three other vendors and gave them our booth number. When they radioed ahead to volunteers on the field, they found room at our space, so pulled us out of line and sent us ahead. They do something similar at load out, necessary because the queue runs six or eight blocks at that point. 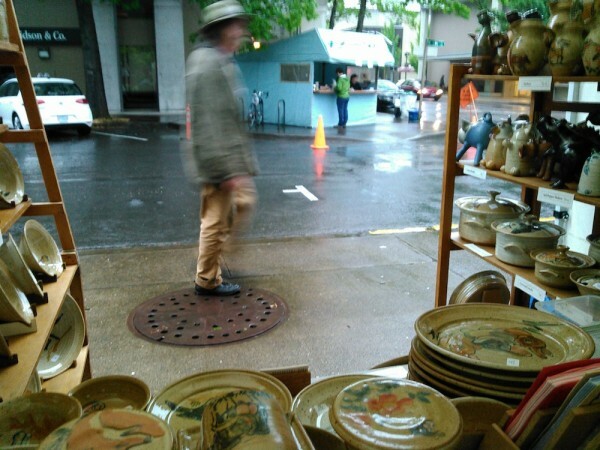 In any event, we parked in front of our spot around ten of ten, immediately set up the canopy, then I hustled in boxes of pots while Denise shifted shelves and stands. At 10:23, I was backing and filling to turn around and cut across a neighboring space to move out and make room for the next vehicle. Setting up... well, on a dry day, we'd have put stacks of pots out front, or in the empty north-facing booths behind us while we assembled shelves. Today, everything had to stay indoors, so it was a lot like those sliding tile puzzles, or, as I said, like dressing in your sleeping bag during winter camping. Still, aside from rain blowing on the edges, we managed to keep everything reasonably dry, and got things out and organized to the point where we could leave the rest for morning by a little after one pm, including a lunch break. Ran a few errands, gassed up the van, and had a leisurely afternoon in our hotel room, listening to someone's lonely doggie crying, down the hall. ETA: Well, that wasn't so bad. Rain tapered down to occasional mist and/or sunshowers, and the big tree that gave me such nice shade last year kept all my boxes completely dry underneath its canopy. And sunshine predicted for the rest of the weekend! There's an art to dumping water off the roof. It accumulates, no matter how well-designed the canopy. The material sags, quarts of water pool. If you don't get it off, it starts to seep through the weave, and before you know it, it's started to rain inside the booth. This is not what I had in mind when I shelled out $283 for my EZ Up. My roof is four-sided, vaguely pyramid-shaped, so water accumulates on either side of the ridge on all four corners. I could just punch up under each corner, but water would fly every which-way, incidentally splashing the neighbor to the right--whose canopy has no sides--and drenching the neighbor to the left, who has no roof at all, poor wet dear. So I splash backwards, onto the landscaping, then forwards, not the sidewalk, first checking that there's no pedestrians coming. After that, I carefully coax water from the side panels up over the seam and on to the front or back. And splash again. Repeat as necessary. It's necessary a lot today. The magnolia tree that provides us with lovely shade on sunny days, today directs all the rain from its canopy onto mine. If you're just going for a random, neighbor-antagonizing splash, you can just jump up and punch the belly of the puddle sagging down into your roof. For more controlled drainage, it helps to have a tool. I used the blunt bottom of a pitcher for the first pass; afterwards, I employ the edge of Denise's lap desk board. It's worked so far. Haven't hit any neighbors or pedestrians. Only my shoes.